(Bloomberg) -- Italy’s assets rebounded as the nation’s political outlook brightened for investors. 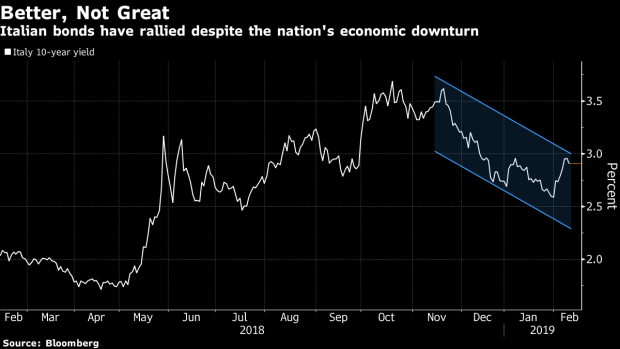 Yields on benchmark bonds tumbled from the highest level in two months after Deputy Premier Matteo Salvini’s center-right political alliance polled strongly in regional elections. The FTSE-MIB index of shares rose ahead of trade talks between the U.S. and China, with the banking sector leading gains after lenders’ bad loans fell in December. Salvini’s League-led center-right alliance took almost 49 percent of the vote in Italy’s Abruzzo region, suggesting it is more popular than its coalition partner, the Five Star Movement. The outcome spurred speculation of fresh elections which could bring a more market-friendly coalition to power devoid of the euro-skeptic Five Star. After enjoying a buoyant start to 2019, Italian markets declined last week as the European Commission downgraded the nation’s growth outlook for the year. The country is currently in a technical recession after data showed the economy contracted in the second half of last year. Italian 10-year yields fell six basis points to 2.90 percent as of 1:15 p.m. in London, having broken above 3 percent Friday for the first time since December. The yield spread over those on their German peers narrowed eight basis points to 279 basis points. The FTSE-MIB index climbed 1.5 percent. Equities advanced as Chinese exchanges reopened after the Lunar New Year holiday and ahead of trade talks in Beijing this week between Chinese Vice Premier Liu He, U.S. Treasury Secretary Steven Mnuchin and Trade Representative Robert Lighthizer. Some of the rally in Italian assets may also have been spawned by a report in La Stampa newspaper that Italy could use its gold reserves to avoid a budget correction, according to Marc Ostwald, a global strategist at ADM Investor Services.